The Driving marathon of the 2014 Alltech FEI World Equestrian Games™ in Normandy held at La Prairie Racecourse in Caen today was nothing short of a thriller. Christoph Sandmann (GER) won this phase of the competition, ahead of compatriot Georg von Stein and the reigning world champion Boyd Exell (AUS). The Australian, who was second after dressage yesterday, has taken the lead in the individual standings with a combined result of 125.83 points. The Dutch team is still in gold medal position followed by Germany, thanks to their extremely strong marathon performances, and Hungary in third. The gravel footing of La Prairie racecourse in Caen guaranteed equal conditions from beginning to end for all of the 46 four-in-hand drivers in competition today. 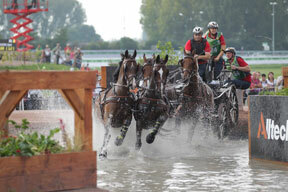 Over 15.000 spectators enjoyed wonderful driving sport under ideal weather conditions for both people and horses. The excitement grew as the event went on given that the best drivers after dressage were the last to start in the marathon. Gigantic screens had been placed all around the venue and the live broadcast allowed spectators to follow their favourite competitors as they drove through the eight beautifully built obstacles. Christoph Sandmann, who had won the marathon at the FEI World Equestrian Games™ in Rome 1998, has always been a very strong marathon driver. His daughter Anna, who is a successful international pair driver in her own right, acted as a navigator on her father’s carriage today. The German won the marathon on home ground at CAI3* Riesenbeck a month ago and felt his horses were in perfect form. “I had a small problem in the first obstacle when I passed a gate and lost precious seconds,” Sandmann said. “After that I really went for it. My horses are super fit at the moment and we have worked very hard. Before the marathon I thought that the obstacles looked quite easy, but they were complex enough. The footing was great, my carriage only drifted once, but that is normal,” he explained. Georg von Stein was the first German driver on the course and his goal was to clear the way for teammates Michael Brauchle and Christoph Sandmann. Von Stein tested different routes in the obstacles, so his compatriots would know which route would be the best. By doing this, Von Stein not only helped his team, but also performed very well individually. The 42-year old riding instructor set very fast times and finished second in today’s competition. Boyd Exell was the penultimate competitor to start in the marathon and the crowd closely followed his performances along with his fellow competitors. The Australian was well on his way, driving his team fluently through the obstacles and recording fast times. But he was a little too brave driving into gate C of obstacle 6 and got stuck for a few moments. After obstacle six, Exell got into fighting mode and set the fastest and second fastest times in the two remaining obstacles, securing third place in the marathon only 0,04 penalty points behind Georg von Stein. Exell has taken over the lead in the overall standings, but is less than one ball ahead of Chester Weber (USA), which guarantees an exciting finale in tomorrow’s obstacle driving competition. Dressage winner Chester Weber had a few problems and was unable to get into the right rhythm. “My horses felt strong in obstacle one and after the second obstacle I could feel that they were setting into a groove,” he explained. “I gave them a little bit of a break before obstacle eight and looking back, I probably should not have done this as it disturbed the rhythm of my right leader horse,” he acknowledged. Weber has dropped to second place in the standings, but still has a chance of winning the gold tomorrow. Theo Timmerman (NED) also had several problems, but was able to hold on to his third place. He is followed by fellow countryman IJsbrand Chardon, marathon-winner Christoph Sandmann and Koos de Ronde (NED), who finished fourth in the marathon. Home driver Sébastien Mourier was one of the first competitors on the course this morning and set the times to beat. The 35-year-old individual driver from France remained in the lead for most of the day, but finished in fifth place in today’s competition.